While most crop markets had a lackluster 2018, wheat enjoyed a rally. But those gains look like they may be fleeting. Wheat could become a victim of its own success. As its price proves to be more attractive than competing crops, there are signs that farmers across the globe are sowing more acres for the first time in four years. The increased plantings are expected to swell global supplies at a time when demand remains tepid. 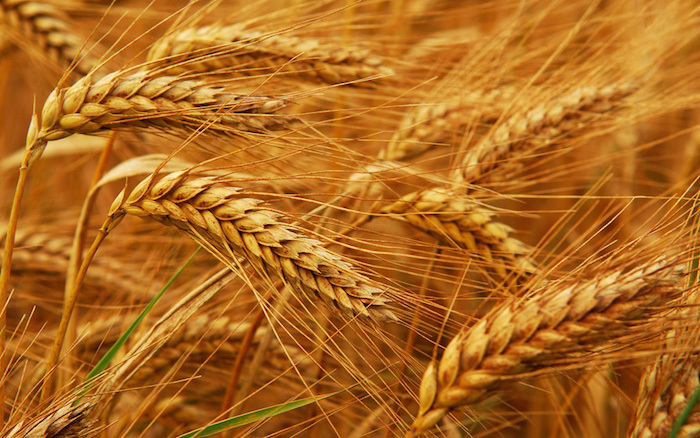 Rabobank International ranked wheat as the most bearish crop for the year ahead, forecasting that prices will peak in the first quarter of 2019. 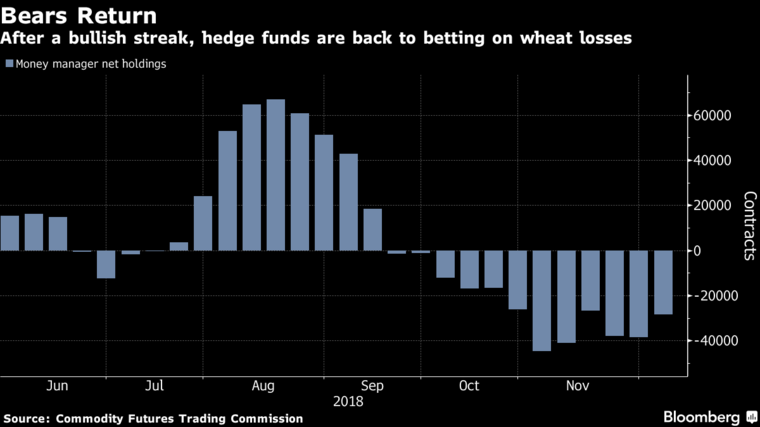 Hedge funds have been betting on price declines for the grain since mid-September. There will be “too much supply of wheat,” Brian Hoops, a senior market analyst at Midwest Market Solutions in Springfield, Missouri, said by telephone. To see prices rise, there would have to be “a crop problem somewhere in the world,” he said. Wheat had a standout 2018. Prices are heading for a 23 percent gain, the top performer among the 11 agricultural commodities in the Bloomberg Commodity Index. 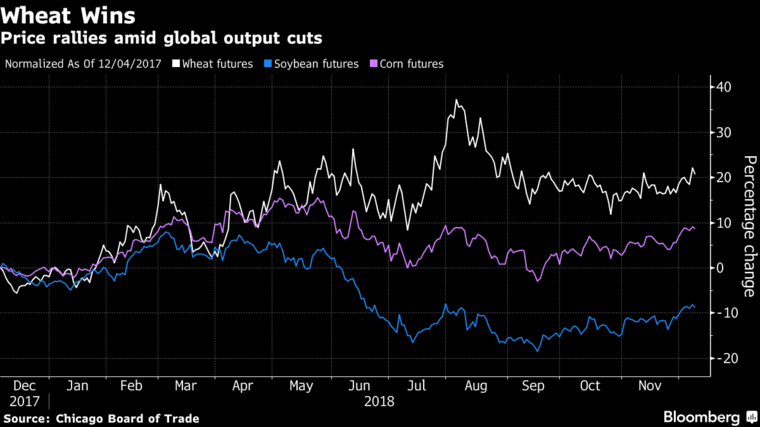 World stockpiles are shrinking after years of gluts, and the crop became a bright spot for growers as trade uncertainty between the U.S. and China weighed on soybeans and corn pared its gains. A lot of the rally was sparked by drought across Europe and the Black Sea region, which bolstered worries over exports. Russia, the world’s top seller, collected a smaller crop for the first time in six seasons. The weather concerns helped push prices to a three-year high in August. The price surge is seen spurring farmers to plant 0.7 percent more wheat in the 2019-2020 season, including in Russia and the European Union, the International Grains Council said in a November report. U.S. farmers are expected to boost acres by at least 2.5 million, and the outlook is “bearish” as another year of weather-related supply disruptions isn’t expected, according to a Nov. 27 report from Societe Generale. Even if availability in the Black Sea tightens and buyers turn to Europe and the U.S., global supplies will be replenished as Argentina harvests its massive crop early in 2019, said Arlan Suderman, chief commodities economist at INTL FCStone in Kansas City. As production rebounds in Australia, Europe and the Black Sea later in the year, it will once again be “tough” for U.S. wheat exports to find a home, he said. This season, American export commitments are trailing last year’s pace by 11 percent, government data show. Amid the sluggish demand, U.S. stockpiles are expected to reach 965 million bushels, according to the average analyst estimate in a Bloomberg survey. That’s higher than the 949 million the government predicted last month. The U.S. Department of Agriculture will release its World Agricultural Supply and Demand Estimates report Tuesday at noon in Washington. Investors are signaling that bigger supplies will lead to price declines. In the week ended Dec. 4, hedge funds held a wheat net-short position of 28,407 futures and options, according to U.S. Commodity Futures Trading Commission data published Monday. The holding, which measures the difference between bets on a price increase and wagers on a decline, has been negative for 12 straight weeks, the longest streak since May. There’s always the chance poor weather could disrupt the hefty supply outlook. Parts of Europe grappled with a dry spell this fall, limiting emergence and early crop development. Winter wheat growers in Kansas faced the opposite problem: one of the wettest Octobers on record delayed fieldwork. Still, further weather challenges would be needed for wheat to sustain its gains.